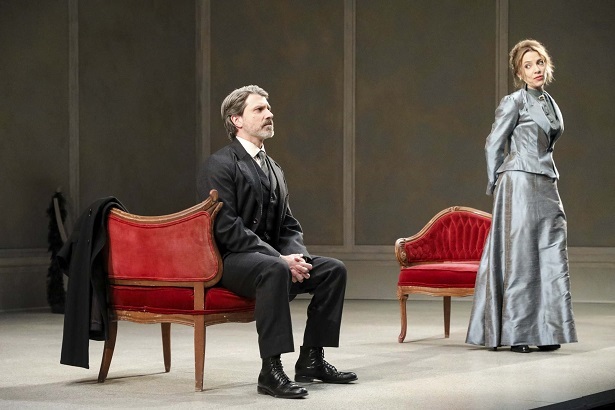 Confession: I have neither seen nor read Henrik Ibsen’s ‘A Doll’s House’ (I know, shame, a retired English teacher and lover of drama) so I’m unable to make any connections to the original story. After seeing this wonderful production, I felt there was no need for me to have seen the first story as Mr. Hnath’s script is spot on with excellent performances delivered by four sensational actors who certainly know their way around a stage. Will I attend a production of Ibsen’s play if it is staged? Absolutely. We are told that, at the end of Ibsen’s story set in 1894, Nora walks out of the house. Part 2 is set 15 years later, so it is now 1909, Norway. Heroine Nora Helmer (a marvellous Deborah Hay) has returned to the same house she exited 15 years ago determined to speak to her husband Torvald Helmer (an impressively heightened performance of anger, resentment and turmoil by Paul Essiembre) and ask him to sign the divorce papers he should have signed years ago so she can move on with her life. In the process, Nora encounters two other individuals who have conflicting issues with her over her departure many years ago – the maid Anne-Marie (an extraordinary Kate Hennig) and Emmy, Nora and Torvald’s daughter (delightful work from Bahareh Yaraghi whom I saw in summer 2018 at Stratford’s production of An Ideal Husband). Director Krista Jackson has taken Mr. Hnath’s dialogue driven script and crafted a carefully paced story of themes that perhaps haven’t really changed over the years. Through some humourous moments and believable poignancy, ‘A Doll’s House Part 2’ covers such ideas as the understanding of men and women in society and their roles; the understanding of marriage and what it really means; male-female relationships; the role of the emerging and independent woman; And yes, at this opening night performance, there were emotionally charged moments with these themes that kept me glued to my seat and wondering where this story was headed next. I especially liked the fact the dialogue was colloquial as it certainly got my attention and helped to sustain my interest. (Be aware that the f bomb is dropped a couple of times). Teresa Przybylski’s stark yet grandiose set design of gray walls and chairs that were covered with a drop cloth suggested to me a sense of emptiness within this room. For me, the room appeared to have a sense at one time of being quite the showplace where people came to be entertained. Now there is a sense that nothing is here. Ms. Pryzbylski’s costumes finely reveal a sense of the upper class. Within the 15 years of her departure, Nora is finely dressed in vibrant colours to show that she has worked hard to establish her current status. The dazzling white skirt Ms. Yaraghi wore subtly reflected two moments for me. Nora’s candid conversation with her daughter sadly revealed how much a mother missed her child growing up. But, like mother, like daughter, Emmy’s youth and innocence is also her desire to make her mark in the world. Even though I’ve never seen nor read Ibsen’s play, I recall from conversations with others that the first concludes with the door slamming of a sound that ‘reverberates all over the world’. Here, the play opens with Nora knocking on the door she slammed all those years ago. Ms. Hay is supremely divine as heroine Nora. Her Nora is a woman who has faced a great deal of hardship as she has tried to find her way in what was very much ‘a man’s world’. She is dressed elegantly but periodically sits like a man to remind us that she has battled and fought with men to find her role in the world. As maid Anne-Marie, Kate Hennig offers an extraordinary performance of a woman who has had to pick up the pieces after Nora left many years ago and became many things to many people. The opening scene between these two women became magical for me to watch and to hear as two powerhouse actors found those silent moments, those stares and glances and heights of emotional impact that kept me glued to the stage to watch every move they made. Paul Essiembre’s Torvald Helmer is a man of strength who has had to cope with the struggle of his wife leaving him some 15 years before. Torvald has probably had to endure endless gossip and rumors about Nora and their deteriorating relationship along with the responsibility of raising three children as a single parent. In this production, we only see daughter Emmy. What impressed me about Mr. Essiembre’s moments with Ms. Hay was the fact that here was a man who has hidden his anger and resentment against his wife for so long that he wanted to let her feel the brunt of it when he first sees her, but society rules claim that he shouldn’t. Ms. Yaraghi’s Emmy is the product of a society in which she was raised whereby in being sweet and polite would most assuredly get her a husband one day. What I liked about Nora meeting her daughter all these years later is the fact that the young child is no longer a child. Emmy is now a grown woman, and Nora realizes that what she has achieved and earned herself in this society has also cost her very dearly in a relationship that should have been first and foremost. ‘A Doll’s House Part 2’ continues to April 14 at the CAA Theatre, 651 Yonge Street. For tickets, please contact www.mirvish.com for further information, to purchase online, or telephone 1-416-872-1212. Running time is approximately 90 minutes with no intermission. Performers: Paul Essiembre, Deborah Hay, Kate Hennig, Bahareh Yaraghi. Photo of L: Paul Essiembre as Torvald and R: Deborah Hay as Nora. By Leif Norman.